In the wake of Prime Minister David Cameron’s call for a voter referendum on Britain’s membership in the EU, new grassroots groups have sprung up supporting a renegotiation of Britain’s EU membership. 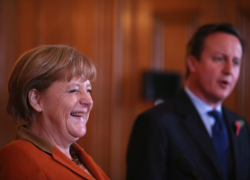 While Britain considers removing itself from the EU entirely, Germany has emerged as a powerful leader in the EU. Some scholars have gone so far as to say that Germany is “keeping Europe afloat.” What led to Germany’s current power player status is complicated. Whether it be Germany’s rapid economic growth or German Chancellor Angela Merkel’s personality is anyone’s guess. Now, as Cyprus repeats the Greek meltdown, it has become clearer that the euro zone has not been able to create a “banking union” in any meaningful sense. Developing a true banking union is made more difficult by the fact that Germany continues to oppose creating a euro-wide deposit insurance program. Despite the Greek bailout in 2010, and the follow-up bailout in 2012 (of which Germany was the biggest contributor of funds), the EU has record-high unemployment. As a result of Germany’s economic influence throughout the EU, it will likely be Merkel who dictates what happens in Cyprus. While Britain was notably absent from discussions surrounding the creation of an EU banking supervisor, Merkel noted that it was “a big step toward more reliability and confidence in the euro zone.” This post explores some of the factors that led to Germany’s strong economic position in the EU and what that could mean for Britain in the future. And with good reason, too! Most people in Germany, even down to the standup comedians, believe that Germany is economically dominant because of their “system of apprenticeships” and commitment to building a society that helps entrepreneurs. Germany also overhauled the labor market in an effort to hold down costs. On top of the societal systems, Merkel reminds Germans of Great Britain’s Margaret Thatcher as one who seems to “balance government accounts as though they were a household budget.” The difference, however, is that Thatcher had the British people’s support for doing so, but Merkel has no democratic mandate. This system has led to Germany being the only country in the EU with the funds necessary to deal with financial crisis. The German economic platform has also given Merkel the power to “dictate the terms under which struggling euro zone nations can apply for further credit, eroding the democratic autonomy of the Greek, Italian and Spanish parliaments.” In 2012, when Merkel approved the second round of bailouts for Greece, she stated: “The risks of turning away from Greece now are incalculable. No one can assess what consequences would arise for the German economy, on Italy, on Spain, the euro zone as a whole and finally for the whole world.” Despite these admonitions, the tide of approval for Greek bailouts was turning. Britain continues to extricate itself from the EU and from any sort of indication that they are willing to assist other failing countries. In the face of calls for Britain to leave the EU altogether and with Cameron seeking re-election, he is unlikely to offer any British assistance that will back British taxpayers into a European Union corner that they do not want to be in. Pulling away from the EU at this point has left an opening that Germany’s economy has filled. The contrast between the economic strength of Germany and the cultural influence of Britain is stark. While Germany seems devoid of a cultural identity, “Britain is the cultural dynamo of Europe by a million miles.” What kind of actual power British cultural influence can bring to the EU with a fledgling British economic system remains to be seen. What is clear, however, is that the world is looking to Germany for economic answers. Stephen Castle, British Group Backs Renegotiating E.U. Role, The New York Times, April 22, 2013. Stuart Jeffries, Is Germany too Powerful for Europe?, The Guardian, March 31, 2013. Hugo Dixon, A Union That Exists in Name Only, The New York Times, March 31, 2013. Louise Armitstead, Germany Approves Greek Bail-out but warns Angela Merkel Against Further Help, The Telegraph, Feb. 27, 2012. David Jolly, Unemployment in Euro Zone Reaches a Record 12%, The New York Times, April 2, 2013. Raf Casert and Don Melvin, EU Backs Banking Supervisor, Greece Bailout, Yahoo! News, Dec. 13, 2012, available at http://news.yahoo.com/eu-backs-banking-supervisor-greece-bailout-145720588–finance.html. 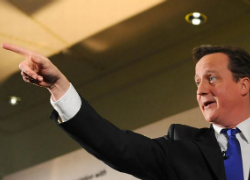 David Cameron Wants Out of the EU: What are the Risks and Rewards? Can’t pick and choose these stars. This first look at the potential impacts of Cameron’s announcement focuses on Great Britain’s current role in the European Union and a few of the political costs that may not be worth any of Great Britain’s solo gains. European citizens, however, directly elect the Members of European Parliament (“MEPs”). There are a total 736 MEPs, while only 72 are from the United Kingdom. According to the BBC, the MEPs as whole have the power to block, scrutinize, and change the laws proposed by the Commission, as well as approve or disapprove of the European Union’s budget. Europe, You Stay Over There. It is no secret that Britain has had a tenuous relationship with the EU despite its status as a Member State; even the giant piece of art that depicts each of the member countries represented on the EU Council of Ministers pokes fun at Great Britain by leaving the country off the mural. The following chart, originally compiled by BBC’s Brian Wheeler and Laurence Peter, lays out the arguments on both sides of the debate over Britain’s future relationship with the EU. Only arguments pertinent to this posting remain and others have been removed. Are there any viable options for Britain leaving the EU? Yes. 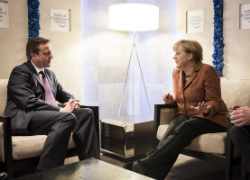 Britain could negotiate an “amicable divorce”, but retain strong trading links with EU nations. . . .Some favour the Swiss model, based on bi-lateral treaties with the EU rather than membership of the European Economic Area (EEA), a kind of “EU-lite”.Others say the EEA/Norway model would be easier as the UK is already a member of the free trade area. Some argue for a clean break from the EU, with the UK free to make trade deals with nations around the word. No. An “amicable divorce” is a pipe dream.France, Germany and other leading EU nations would never allow Britain a “pick and mix” approach to the bloc’s rules.Norway and Switzerland have to abide by many EU rules without any influence over how they are formed.”If we weren’t in there helping write the rules they would be written without us – the biggest supporter of open markets and free trade – and we wouldn’t like the outcome,” argued David Cameron in a speech last year. If Britain went for a clean break from the EU, its exports would be subject to EU export tariffs and would still have to meet EU production standards. What would be the impact on British jobs? With small and medium-sized firms freed from EU regulation, there could be a jobs boom. More than 90% of the UK economy is not involved in trade with the EU, yet still bears the burden of these rules, says the Bruges Group. The Eurosceptic think tank claims pulling out of the EU but staying in the EEA would create 1 million British jobs. Millions of jobs could be lost as global manufacturers move to low-cost countries within in the EU. Britain’s foreign-owned car industry would shift into the EU and sectors linked to membership such as aerospace would suffer. Airbus production could move to France and Germany, pro-EU commentators claim. Would Britain save money?The UK paid £8.9bn into EU budget in 2010/11, says the Treasury, out of £706bn in public spending. Yes. It would save billions in membership fees, and end the “hidden tariff” paid by UK taxpayers when goods are exported to the EU, caused by red tape, waste, fraud and other factors.A study by UKIP MEP Gerard Batten claims the total cost to the UK of EU membership, when all these factors are taken into account, is £65.7bn a year. No. The UK’s contribution to the EU budget is a drop in the ocean compared with the benefits to business of being in the single market, says pressure group Business for New Europe.It could be costly for UK exporters if they face EU legal arguments against UK standards – there could be a lot more court cases. What would be the effect on trade? “We will continue to trade with Europe, as part of an association of nation states,” says Eurosceptic Tory MP Bill Cash.The UK would also be free to establish bi-lateral trade agreements with fast-growing export markets such as China, Singapore, Brazil, Russia and India through the World Trade Organisation. The EU is the UK’s main trading partner, worth more than £400bn a year, or 52% of the total trade in goods and services.”The UK is always likely to be better positioned to secure beneficial trade deals as a member of the EU than as an individual and isolated player,” says Labour’s Europe spokeswoman Emma Reynolds. Would the UK’s influence in the world change? The UK would remain a key part of Nato and the UN Security Council and a nuclear power, with a powerful global voice in its own right. The Bruges Group wants an end to the “discredited” principle that Britain acts as a transatlantic bridge between the US and Europe, saying it should make self-reliance its guiding principle. Stripped of influence in Brussels, Berlin and Paris, Britain would find itself increasingly ignored by Washington and sidelined on big transnational issues such as the environment, security and trade.America and other allies want Britain to remain in the EU. The UK risks becoming a maverick, isolated state if it leaves. Would taxes change? The EU has limited power over tax, which is largely a matter for national governments. The exception is VAT which has bands agreed at the EU level. Outside the EU, the UK would potentially have more flexibility. “Tax avoidance and evasion will reach crippling levels as our economy becomes increasingly wholly owned by foreign multinationals that make tax avoidance in Britain central to their business strategy,” claims The Observer in a recent editorial. Would Britain’s legal system, democratic institutions and law-making process change? It would be a major shot in the arm for British democracy as the Westminster parliament regained its sovereignty and re-connected with voters.The country would be free from the European Arrest Warrant and other law and order measures, but would still have to deal with the European Court of Human Rights, which is separate from the EU. Britons benefit from EU employment laws and social protections, which would be stripped away. Withdrawal from the European Arrest Warrant could mean delays for the UK in extraditing suspects from other European countries; and the UK already has some opt-outs from EU labour law, including the Working Time Directive. As EU budget talks heat up, many will be monitoring Britain’s bargaining effectiveness with Cameron’s comments looming over any budgetary talks. Since Cameron has sent the signal that Britain is not interested in any crucial positions within the EU, Britain may have already set itself up to have less bargaining power in the future. Profile: European Union, BBC News, Nov. 30, 2012, http://www.bbc.co.uk/news/world-europe-18788906. Stephen Castle, Critical Stance on Europeans May Jeopardize Britain’s Influence, The New York Times DealBook, Ed. Andrew Ross Sorkin, Jan. 22, 2013. Richard Fletcher, Davos 2012: David Cameron’s ‘stop tinkering’ call wins Britain few friends in Europe, The Telegraph, Jan. 26, 2013. BBC News- Inside the European Commission, BBC News Video, April 28, 2009, http://news.bbc.co.uk/2/hi/europe/8021647.stm. BBC News- How the European Parliament Works, BBC News Video, April 28, 2009, http://news.bbc.co.uk/2/hi/europe/8021660.stm. Brian Wheeler and Laurence Peter, The UK and EU: Better off out or in?, Jan. 16, 2013, http://www.bbc.co.uk/news/uk-politics-20448450.